I got my Hero Arts monthly kit yesterday and had a little time to play with it last night. The theme this month is Arabian Nights it's currently (12/13) still available here. For this card I used the fancy window die. I cut the transparency and back of the shaker with just the outline. and I cut the front and 5 black cardstock panels with both the outline and fancy design. I cut out the lattice from all the black panels to create the space for the glitter (I have a ton left over from Christmas cards and trying to use it up) I glued it all together and attached it to a 4x5.25 base from Lawn Fawn Let's Polka In the Dark. 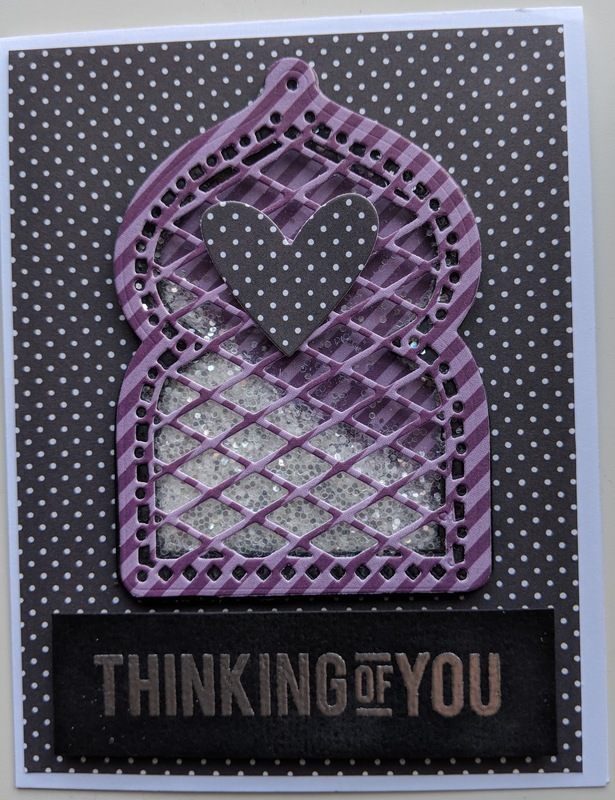 I used a piece of black cardstock and a greeting from Simon Says Stamp (no longer available) and heat embossed with Silver the greeting and finished off the card with a heart from Lawn Fawn.